Sexuality was once at the very heart of Reichian and neo-Reichian models of psychotherapy and health. This seems often to no longer be the case. This workshop will afford us as a group an opportunity to consider the reasons and the consequences for the frequent marginalization of sexuality in contemporary psychoanalysis and psychotherapy. Each of us may have experiences of our bodies—our identities and sexualities—that are so private and delicate that we can find it nearly impossible to speak of them to anyone. Some of us may have one or two trusted people with whom we can talk of these matters. This is often true for clients and professionals alike. Yet how can we learn to discuss these important dimensions of human life at professional and community levels where meaning is also made, where behaviors are deemed permissible or forbidden, and where identity is often shaped through countless, complex interactions? This two-day, experiential workshop is intended for a community of professionals who want to develop a way to talk, collectively, about sexuality, sexual identities, and preferences—of which gender is often a central aspect. We will acknowledge the important role of the family and community in structuring the intensity of sexual passions, which may include biases against certain forms of love, sexual preferences, and gender orientations. We will begin to identify the issues related to gender and sexuality that we often find ourselves avoiding or that we may have no idea how to address. In this workshop we will explore the meanings of sexuality, aggression, transgression, and excess. Seminaret er primært for NKIs medlemmer og kandidater med påmeldingsfrist 20. januar. Etter påmeldingsfristen åpner vi opp for at også andre interesserte kan melde seg på. Det er begrenset plass så det anbefales å sende påmelding så tidlig som mulig for å sikre din plass (påmeldingen er bindende). Påmelding kan gjøres på ved å bruke skjemaet under eller ved å sende en epost til kontor@karakteranalyse.no. 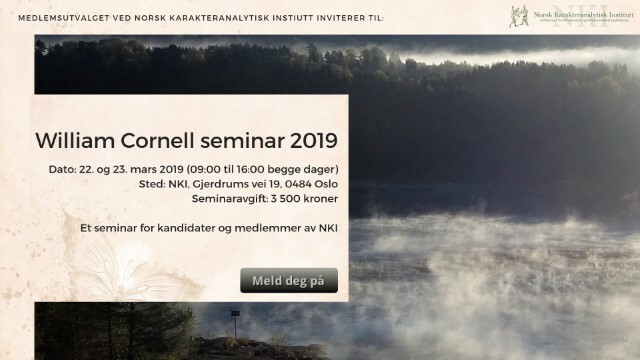 Jeg ønsker med dette å melde meg på "William Cornell seminar 2019". Du vil du motta en bekreftelse på epost i løpet av de neste dagene. Merk at påmelding skjer fortløpende og at det er begrenset plass på seminaret. William F. Cornell, M.A., TSTA, maintains an independent practice of psychotherapy and consultation in Pittsburgh, Pennsylvania. Bill studied behavioral psychology at Reed College in Portland, Oregon and phenomenological psychology at Duquesne University in Pittsburgh, Pennsylvania. He followed his graduate studies with training in transactional analysis and Radix body-centered psychotherapy. Since those trainings, Bill has studied with several mentors and consultants within psychoanalytic perspectives. He introduced and edited The Healers Bent: Solitude and dialogue in the clinical encounter, the collected papers of James T. McLaughlin and Intimacy and Separateness in Psychoanalysis, a collected papers of Warren Poland. A co-editor of the Transactional Analysis Journal, Bill is the author of Explorations in Transactional Analysis: The Meech Lake Papers, Somatic Experience in Psychoanalysis and Psychotherapy: In the expressive language of the living, Une Vie Pour Etre Soi, and a co-author and editor of Into TA: A comprehensive textbook, as well as numerous articles and book chapters. He is the author of the forthcoming Countertransference and Subjectivity in Clinical Practice: Self-examination in psychoanalysis and psychotherapy to be published by Routledge and Further Explorations in Transactional Analysis: At the interface of TA, psychoanalysis, and body psychotherapy. He is a recipient of the Eric Berne Memorial Award and the European Association for Transactional Analysis Gold Medal, in recognition of his writing. Bill has been a central figure in the ongoing dialogue between communities of contemporary psychoanalysis and body psychotherapy. 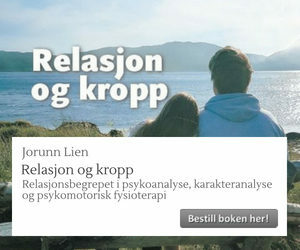 Karakteranalyse.no er den offisielle nettsiden til Norsk Karakteranalytisk Institutt. Hovedformålet med denne nettsiden er å informere om Instituttets utdanning og faglig utviklingsarbeid innen karakteranalytisk psykoterapi.